The much maligned Morgan Le Fay was, to a large extent, the invention of medieval romance writers such as Sir Thomas Malory. In his "Le Morte D'Arthur" Malory tells us that Morgan was one of the half-sisters of King Arthur, daughter of Ygerna and her first husband, Gorlois. The Vulgate Cycle of Arthurian tales tells how she became Guinevere's lady in waiting and fell in love with the King's nephew, Giomar. Guinevere, however, put an end to the romance and, as a result, Morgan eventually betrayed the Queen's affair with Lancelot to King Arthur. She even sent the Green Knight to Camelot in order to frighten Guinevere to death. Morgan herself took a fancy to Lancelot at one point and imprisoned him for some time before he was able to escape. Chrétien describes Morgan as a giver of healing ointments, but the lady is usually portrayed as a wicked enchantress who learned her initial mysterious skills from her corrupt education in an early Christian nunnery. Later, Merlin helped her to extend her magical powers. The story that she enticed King Arthur into an incestuous affair from which Mordred was born is, however, a misconception derived from the desire of modern authors to merge Morgan with her more sympathetic sister, (Anna-) Morgause. Malory shows how Morgan hated Arthur for his purity and plotted with her lover, Sir Accolon, to steal both Excalibur and the British throne. Arthur met Accolon in combat without his magical sword, but the Lady of the Lake helped him retrieve it and win the battle. In return, Morgan stole Excalibur's scabbard and threw it into the nearest lake. She eventually escaped Arthur's wrath by transforming her entourage into stone. Morgan retired to Gore (North Rheged) and then to her Castle of Tauroc (possibly in North Wales). The Royal court appears to have thought her dead until Arthur came across her residence while out hunting one day. The two were immediately reconciled. In late life she moved to the Isle of Avalon, and it was to here that she and her allies, the Queens of Northgalis (North Wales) and the Wastelands, took her wounded brother to be healed after the Battle of Camlann. Malory makes Morgan the wife of King Uriens of Gore, an actual historical mid to late 6th century monarch of North Rheged (what is now Cumberland and Westmorland in Northern Britain). Though technically this may have been just about possible, during this time period it is stretching credulity a little far. Morgan was an elder half-sister of King Arthur who fought at Mount Badon around 495-500 and traditionally died in 537. Urien was assassinated during a military campaign around 590. The earlier Vulgate Cycle, however, makes Morgan a generation younger, being the daughter of King Lot of Lothian (Gododdin). On the other hand, Welsh Tradition tells us that Urien's wife was Modron ferch Afallach, apparently a sister-in-law of King Maelgwn Gwynedd, and it may be that two ladies have become confused. Alternatively, this latter identification may betray the lady's true origins as a Pagan Celtic Goddess. Modron was the name of the Celtic Mother-Goddess, often depicted in Romano-British times as having a triple personality. This may be seen in Arthurian tales through her association with the Queens of Northgalis (North Wales) and the Wastelands. The Lady of the Lake may have been another aspect of the lady. Modron's father, Afallach, was the titular God of the Celtic Otherworld, Avalon. Morgan is said to have lived here with her nine sisters, a not insignificant group similar to the Greek Muses. Some early sources actually refer to Morgan as "the Goddess," while her shape-shifting and healing aspects clearly indicate heavenly powers. She appears to have gradually degenerated into "Le Fay" - a fairy - who could fly through the air on enchanted wings: to this day, the Breton name for a water-nymph is a Morgan. The lady's wicked character appears to have been the invention of the Cistercian monks who wrote the stories of the Vulgate Cycle. Influenced by memories of the ancient Irish Goddess, the Morrighan (Phantom Queen), another triple-aspect divinity representing life & death, sexuality and conflict, they painted poor pagan Morgan as black as they could. They believed it blasphemous for a healer to be neither male nor a member of a religious order and Morgan paid dearly for her reputation. Geoffrey Ashe (1990) Mythology of the British Isles. Peter C. Bartrum (1993) A Welsh Classical Dictionary. Ronan Coghlan (1991) The Encyclopaedia of Arthurian Legends. David Day (1995) The Quest for King Arthur. Chrétien De Troyes (1160) Erec and Enide. Chrétien De Troyes (1170) Yvain. Miranda J. Green (1992) Dictionary of Celtic Myth and Legend. 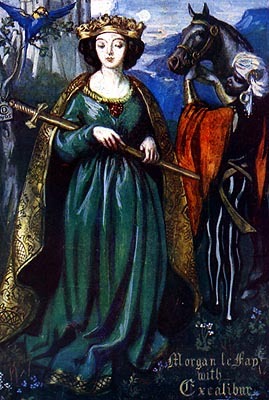 Phyllis Ann Karr (1997) The Arthurian Companion. Thomas Malory (1485) Le Morte D'Arthur. John & Caitlin Matthews (1988) The Aquarian Guide to British and Irish Mythology. John Matthews (1994) The Arthurian Tradtion. Geoffrey of Monmouth (1150) The Life of Merlin.